During the White House Science Fair Tuesday (Feb 7) four Kohala Middle School students had the honor of presenting their exhibit ‘Improving the Environment One Community at a Time’ for President Obama and officials. Isabel Steinhoff, Rico Bowman, Genevieve Boyle and Mina Apostadiro took first place in the grade 6-8 division of the 2010-2011 Siemens “We Can Change the World” Challenge, for their household battery recycling effort to collect 6,000 batteries in 60 days. 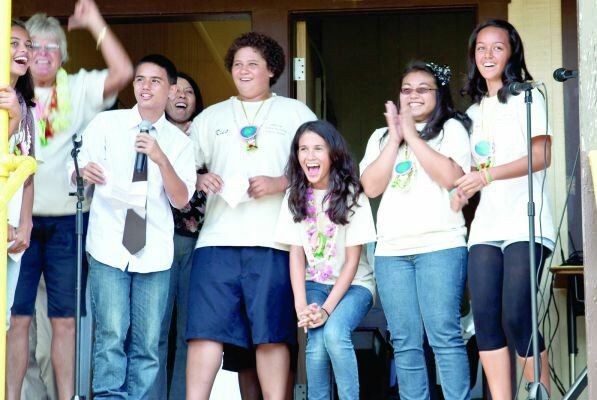 The team’s mentor is Lani Bowman, a former part-time teacher at Kohala Middle School. 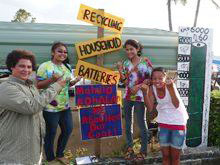 The team, named ‘6000 n 60’, embarked on a campaign to improve their community’s use and disposal of batteries by giving people information on the environmental harm of batteries disposed improperly along with providing tips on how to better use battiers and provide opportunities for recycling. The team distributed surveys to gauge community awareness on the issue before and after the collection. A logo and t-shirts were created along with promotional materials to raise awareness and increase participation in the recycling effort. The team also involved the school and community through school bulletins, assemblies, posters, PSAs, presentations to community organizations, had a community kickoff event, a Facebook page and guest speakers. Students set out bins to collect used batteries. 6000 n 60 met their goal of collecting 6,000 batteries and the team is using their data to lobby the country for better battery recycling opportunities. For their Siemens prize team members each receive a $10,000 U.S. Savings Bond, a trip to Costa Rica this summer and a pocket video camera to document their adventure.